I’ve been reading your novel A Tale of Two Halves. I’ve found it fascinating to read about Jay and his teenage gang. It is such a gritty story line. Of course there weren’t any children like that at my school but I often saw them from the Bentley. Anyway, I was totally gripped and wondering what D’s vicious dad does next and then I reached page 72 and it was blank. In fact, the rest of the entire book was blank! I suggest you contact your publisher and tell them there is a major printing error. Also, I’d like a replacement copy. Ps: Unless you want my copy back, I’ll use the blank pages for my recipes. I know this may difficult for you to comprehend but A Tale of Two Halves is meant to have empty pages. It’s a competition. Work it out. Ps: I’m surprised you cook anything remotely edible that needs recording. How does the competition work then? Am I supposed to guess the ending or purchase numerous copies and hope one has the elusive second half? Or maybe if I find a complete copy I win a prize? If so, what’s the prize? A night out in Newcastle? Ps: I really enjoyed your novel, Streakers. I couldn’t stop laughing. Then I woke up. The prize is not a night out in Newcastle. The prize is a contract with PaperBooks. Of course, an intelligent person might have deduced that the empty pages are where the story is to be continued. Ps: I really enjoyed your blog. I couldn’t stop crying. Eventually I slept. That’s an amazing prize! PaperBooks are very innovative and original, I’m impressed. So how come they choose you to write the first half? Ps: Can anyone enter this competition? Subject: RE: RE: RE: RE: RE A Tale of Two Halves. Yes, it's a fantastic prize. PaperBooks are indeed very innovative and original. That’s why they chose me to write the first half. I’m also handsome, intelligent and, fortunately, very good humoured. Ps: Anyone can enter the competition. Unless their first name is Jane. Otherwise the author, whose first name is Gary, will take a gun to his head. You always have to have the last word don’t you? Gary Davison lives in Newcastle and is the author of Fat Tuesday and Streakers. As well as writing part time he runs his own business and plays golf with a poor handicap. He doesn’t own a gun. To read our interview with Gary click here. To read our review of Fat Tuesday click here. 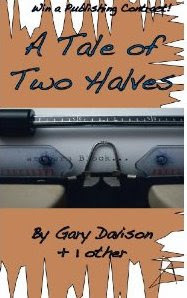 For full details of The Tale of Two Halves competition visit the PaperBooks website here. To visit Gary's blog click here. Great competition. Great story. Great fun. Hi Tracy. Good questions. I think it would be quite tough trying to follow in the same style, mainly because of the northern accent in there. And of course for women, as they would not have experienced being a young ten year old boy! Not that it would be impossible to successfully crack both of those and come up with the voice and style to match, but a big ask, and a big risk. I think the judges will be looking for action, pace, own style and great story. A completely different view point, I think, could work really well. If you have any other questions feel free to get in touch and as the closing date gets nearer, I'll pester the judges and find out a few tips and post them up.